These are portioned for someone my size. You might need to increase the amounts of each item, especially if you’re a guy. A couple of the breakfasts reference homemade turkey sausage. Here is my recipe. Banana overnight oats topped with 2 teaspoons of sliced almonds, 2 homemade turkey sausage patties. We make the Banana chocolate chip recipe from this site with no chocolate and no sweetener. The recipe makes two servings if you’re small person and one if you’re not. 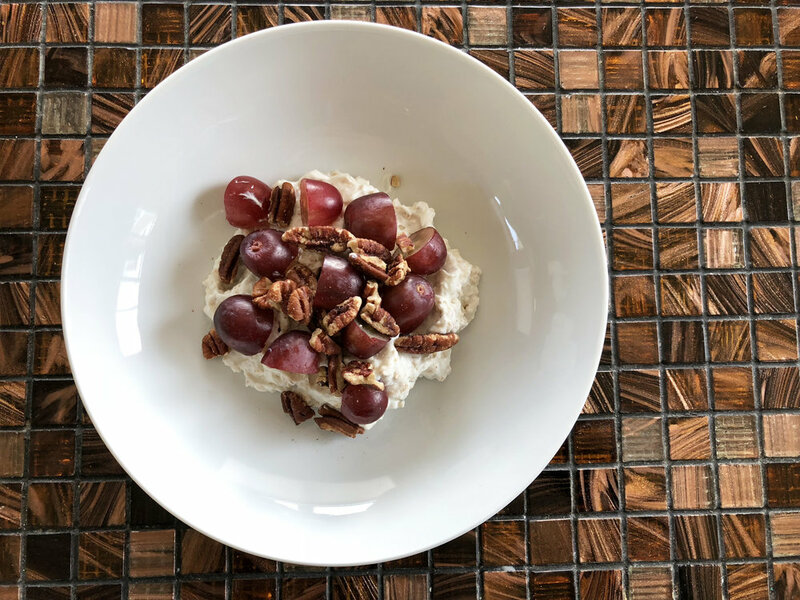 Mix 1/4 cup 1-minute oatmeal with 1 - 5.3oz container of Siggi’s Iceland Yogurt Vanilla and 1/2 cup grapes. Top with 1 tablespoon walnuts. Iceland yogurt has just a ton a protein for yogurt, however, the vanilla flavored yogurt does contain sweetener in the form of agave nectar. You could use plain yogurt if you do not want that added sweetener. I would probably add more fruit to sweeten it up if you do this though. Bananas are good too.